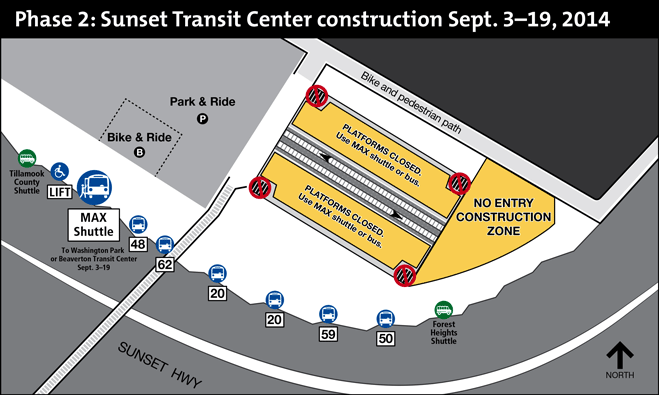 TriMet’s Sunset Transit Center MAX Station east and westbound platforms will soon be closed for roughly two and a half weeks to allow TriMet crews and contractors to remove and replace the existing platforms. Trains will continue to run between Hillsboro and Gresham, however, they will not pick up or drop off riders at Sunset TC. Regular bus service to Sunset Transit Center will remain the same. All lines that currently serve the transit center will continue on the regular schedule including lines 20, 48, 50, 59 and 62. The Park & Ride and Bike parking will remain open and frequent shuttle bus service will be provided from Sunset Transit Center to Washington Park or to Beaverton Transit Center where riders can transfer to trains. Riders should plan an extra 15-30 minutes if using the shuttle service from Sunset. Phase one of this multi-phased construction project began on July 2. To minimize impacts on our riders, work began on the back half of the east and westbound platforms. Crews worked in the overnight hours to saw cut and remove portions of the existing platforms. During phase two, TriMet and the general contractor, Brown Contracting, Inc., will remove the remaining existing platforms materials and pour new foundations and cast-in-place platforms. The existing platform was cracking and in need of repair. The total project cost is $1.7 million. The station, which opened in 1998, is in need of essential updates including replacing the platforms. Due to water drainage issues the existing grout that secured the platform tiles to the platform is washing away. The new platform will be more durable. Crews will also be making adjustments to the grade of the platforms and installing the foundations for the future e-fare system. Sunset Transit Center MAX Station will be closed for about two and a half weeks. Trains will continue to run between Hillsboro and Gresham, however, they will not pick up or drop off riders at Sunset TC. Regular bus service to Sunset Transit Center will remain the same. All lines that currently serve the transit center will continue on the regular schedule. Lines include the 20, 48, 50, 59 and 62. Plan ahead: Allow an extra 15-30 minutes if you will be taking shuttle service from Sunset TC.